Planting purple crocuses to eradicate polio. Key Stage 2 children had a visit from The Rotary Club (Basildon) on Monday, 29th October. They shared the work they are doing in their project to eradicate polio. (We have put an item in our Year Book about this.) 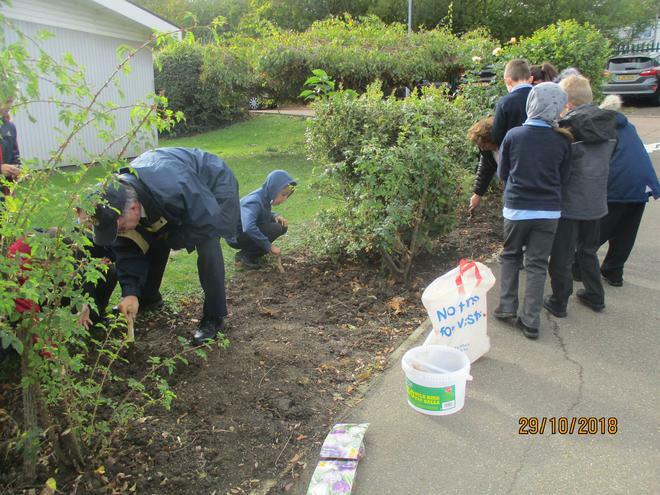 Members of the Eco-council planted a number of purple crocus bulbs in the front flower beds. The colour purple is a reminder of the indelible pen colour used to mark the little fingers of children when they receive the vital vaccine.